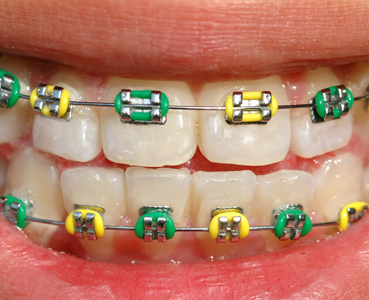 Visible brackets are used to correct the position of the teeth with the braces placed on the outside of the teeth. 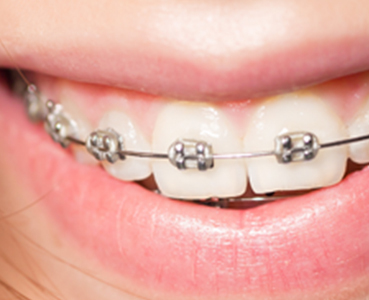 Metal, ceramic or sapphire braces are ideal option for children and teenagers, as well as for adults who do not mind wearing visible brackets. As each patient is unique, your treatment will take into account your own individual needs. At Ortodoncia Tres Torres Barcelona we specialise in braces and will tell you if visible brackets are the best option for you. Once we have diagnosed your problem and told you how long possible treatment will take, we will quote you a fixed price with 0% finance. Make an appointment with no obligation! The average time to get used to them is only about 10 days. Orthodontics with brackets is Ideal for children and teenagers. You can opt for more discreet, transparent brackets; our ceramic or sapphire brackets which are barely noticeable to others. With self ligating brackets (SLBs), whatever material they are made of, the orthodontist connects the wire to the bracket with a metal cap that goes up or down to connect or disconnect the wire. We use the best brands of SLBs such as Damon, InOvation or SmartClip. Unlike other dental clinics, at Ortodoncia Tres Torres Barcelona we use white arches or wires as they are the most discreet option when used with ceramic brackets. 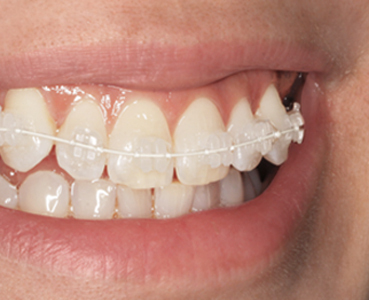 Brackets can be used in 100% of cases and are equally as effective as other types of braces. Brackets, either metallic or ceramic, are very resistant, so this traditional treatment ensures the predicted results. SLBs are highly effective and the check-up visits last 25% less time than with other treatments. Esthetic braces also have the advantage of being discreet due to their transparency and are recommended for patients with allergic reactions to metal, as they do not contain alloys. In addition, when visible braces are used, veneers to fill holes after dental extractions can be inserted. This is the most economical and resistant type of brace and particularly recommended for children and young people. It’s even possible to use coloured rubber bands on the braces. We highly recommend brackets brackets if you are between 10 and 18 years old, or an adult needing treatment for many different dental problems including malocclusions.